In the autumn I was lucky enough to visit the beautiful gardens at Stourhead in Wiltshire. With its pretty lake surrounded by wooded hillsides dotted with follies of all shapes and sizes, Stourhead has a dream-like quality about it, an eighteenth-century recreation of an ancient Roman paradise. It’s got its own version of the Pantheon, complete with grand portico, dome and marble sculptures, a medieval cross, and a even a quaint ‘Gothic’ cottage with rustic windows and a thatched roof. But surely the most atmospheric spot at Stourhead is the Grotto, constructed in 1748 for then owner Henry Hoare, and designed by Henry Flitcroft. Wealthy Georgian gardeners, it seems, had something of a taste for magic, and a dark and creepy underground cavern was an important element in any grand garden of this period. From a distance the Grotto at Stourhead, which sits right of the shore of the lake, looks like nothing more than a huge pile of mossy rocks. 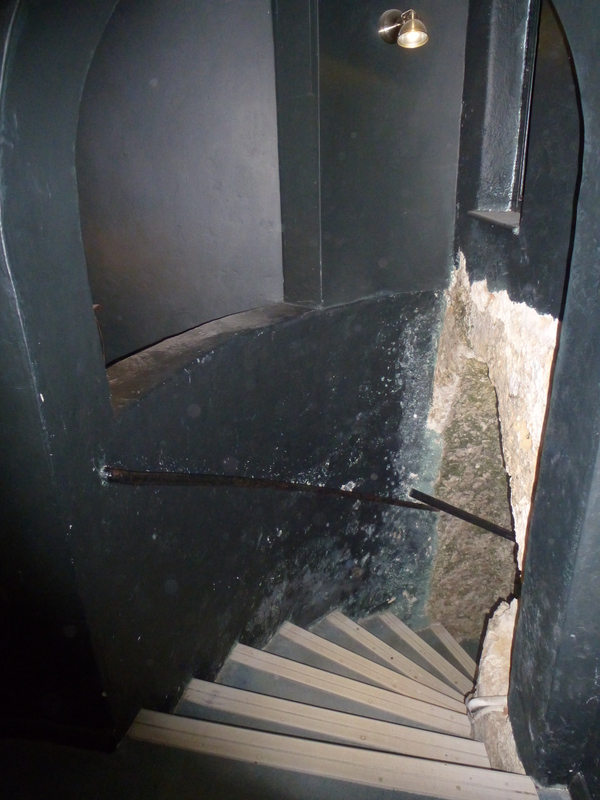 On closer inspection, however, a set of twisting steps can be seen leading down to a shadowy doorway. Beyond lies a dark – very dark – underground passageway, the only light coming from small apertures in the roof and the side, the latter offering wonderful views over the lake outside. And drink in silence, or in silence lave. Further along, hiding out in a gloomy, water-filled cavern, sits a dramatic bearded river god, a spring from the River Stour pouring noisily from his urn. I may have visited the gardens at Stourhead a little to late to see the amazing autumn leaves which attract thousands of visitors every year, but in a way I was glad to catch it at a quieter moment. Wandering alone through the tunnels of the Grotto, the weak November sun setting over the damp Wiltshire hills, it really was possible to experience the sublime wonder of this magical place, and feel the thrill that has been enjoyed by visitors to this place for over three and a half centuries. In 1838, workmen digging in the garden of the Belle Vue Cottage on the outskirts of Margate came across a stone slab which covered a narrow hole. On removing the slab they discovered that this hole led down to a tunnel. But this was no ordinary tunnel, for what they had found turned out to be the dome of what the Kentish Gazette described at the time as a ‘kind of Aladdin’s cave’. The complex of tunnels underneath the garden were lined with incredible shell decoration, the like of which had never been seen before. The mysterious Shell Grotto in Margate has been attracting visitors ever since, and indeed this strange attraction is still open to the public today. 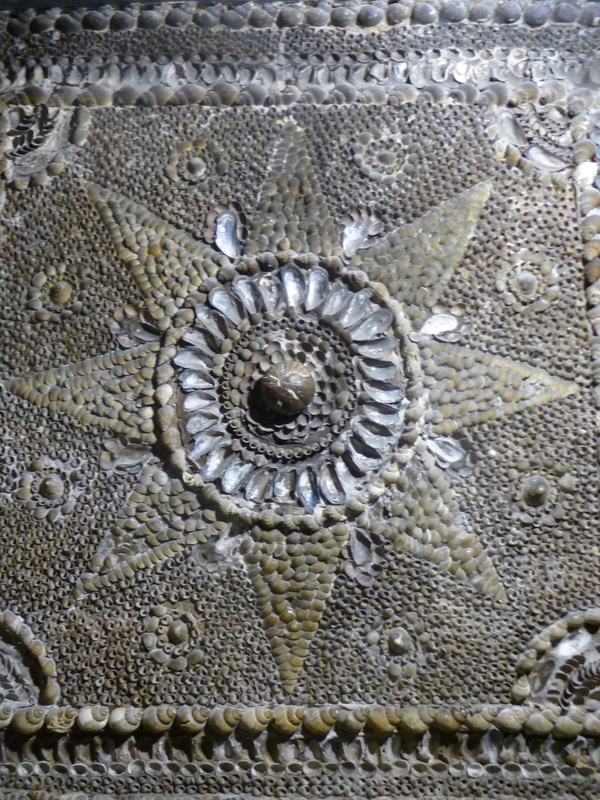 A visit to the Margate Shell Grotto begins with the small museum at ground level, which gives some of the background to the discovery of the tunnels and the diverse theories that have emerged as to their origins. Next comes the really exciting part. 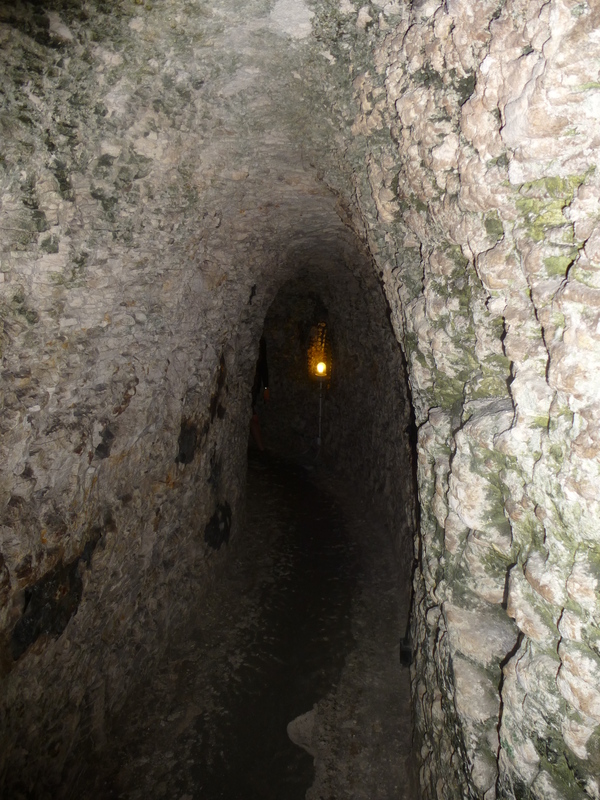 The Grotto lies down a flight of stairs and at the end of a narrow rock-cut cave which descends into the darkness. Once inside the grotto proper, every inch of the tunnel walls are decorated with elaborate symbols and patterns, a mosaic created from millions of tiny shells. The effect is breathtaking, particularly in the central roundel which is lit from above by an open dome. 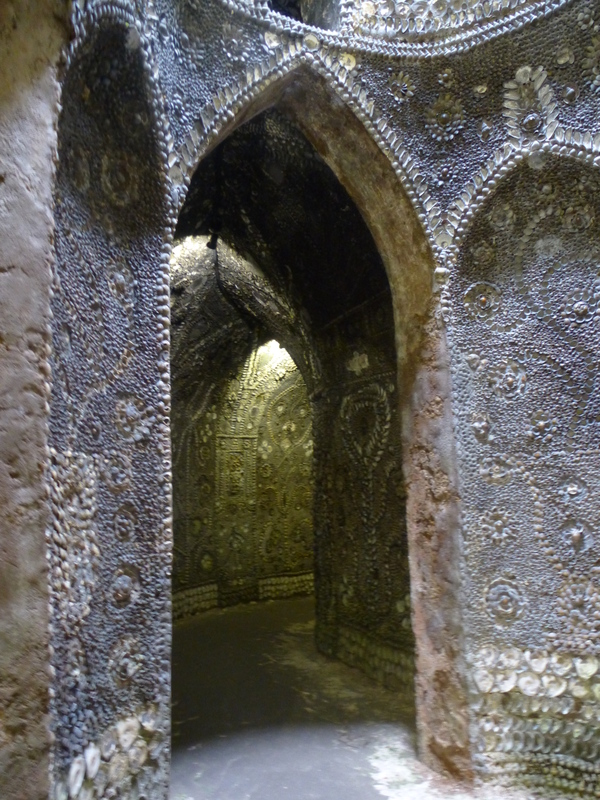 The amount of time and effort which went into building this grotto is immense; a similar but much smaller shell grotto created at Goodwood in West Sussex during the 1740s took seven years to build, and that has a floor space of only four square meters, while the shell mosaics in the Margate grotto cover seventy feet of tunnels. Even the task of collecting the many shells would have taken years, because although Margate lies on the coast, the nearest beach which could supply such large quantities of shells is located over six miles away. 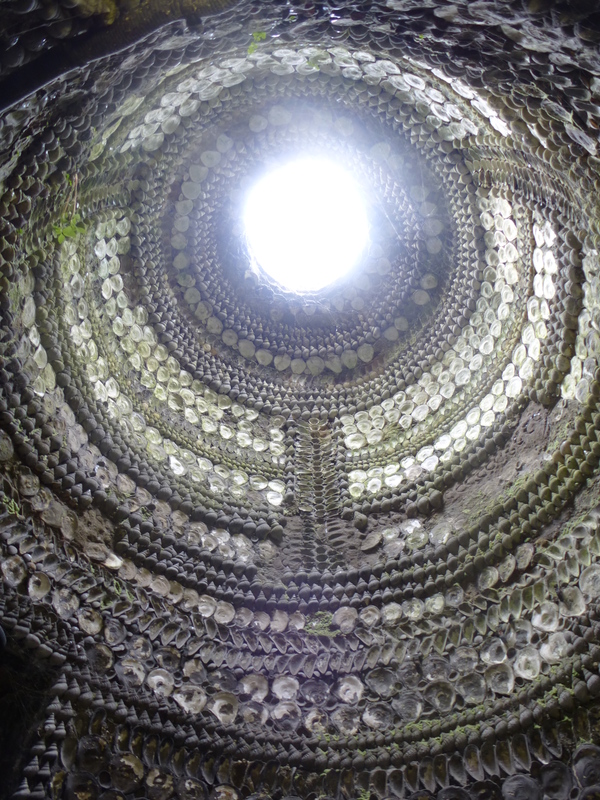 What is even more strange about the Margate’s Shell Grotto is that noone knows when, why or by whom it was built. Many theories have been put forward over the last century and a half, ranging from the eccentric to the utterly unbelievable. Many have compared it to other 18th Century shell grottoes, but if it had been built during the 1700s then why would it have been blocked up and totally forgotten by the mid 19th Century? If it was an extravagant folly like the example at Goodwood, then why did noone know about it, and why would it be located on what was previously undistinguished farmland? The strange symbols and patterns used in the decoration of the grotto are largely unique, and give few clues to their age. Some have suggested that this is a Roman temple, some believe it to be related to a possible Phoenician trading post, while suggestions that it can be attributed to Minoans, Hindus or Mexicans seem entirely fanciful. Attempts to carbon date the shells have proved fruitless, as the rudimentary lighting used in the grotto in the 19th Century has coated the shells in carbon deposits, and extensive restoration over the years means that analysing the mortar and shells is probably only going to confuse matters further. The map given to visitors attempts to interpret some of the symbols on the walls as a skeleton, an owl, a god and a goddess amongst many others, but the interpretations require a vivid imagination and are frankly rather subjective. It seems then that the Margate Shell grotto is destined to remain an intriguing, magical enigma for many years to come. To be honest, I wouldn’t want it any other way.